Which homehealth agencies are the best to work for? Hi! I'm wondering the same thing as well. I'm currently on a hospital med-surg floor, and wanting badly to get out. I hear great things about home health. I've looked at the 3 major companies in my area (Bayada, Amedisys, Gentiva), and they all get horrible employee reviews online. Which home health company is great to work for? What qualities of scrubs to you look for??? print design: no theme yet, but i tend to buy alot of flowers/butterflies prints. style: i :redbeathe pockets! shirt has to have two patch pockets. the side slit pockets just don't cut it for me lol. i like the cherokee shirts because they have the extra cell phone pocket that i put pens in. my pants have to have at least one cargo pocket. fit: not too tight, and not too baggy or frumpy. color: as i look at my scrubs, i'm noticing that i have alot of red/pink and shades of blue going on. brand: shirt: cherokee workwear v-neck or cherokee hq prints. pants: my very very favorite is koi lindsay pants, but they are kinda pricey and getting hard to find in tall sizes, so i also like the cherokee workwear unisex drawstring cargo. Congratulations Wicked Wahine! I agree with you, when I was on the waiting list, it was first come, first serve. Grades didn't have anything to do with it. I don't agree with that; I think grades on your prereqs should come into play, but it's the way it was. I also had a 4.0 in my prereqs and it didn't make a bit of difference. I didn't have a PDA in school, but one of my classmates did and she loved it. Had her Davis Drug guide on there and was pulling it out all the time. But, I think a quality stethoscope would be a good purchase. I had a cheapo one that I hated and just recently replaced with a Littman, which I love! I say get a middle of the line Littman, like a Classic or even the Lightweight one would be good. I like Cherokee Workwear. They are good quality and pretty cheap and they come in a whole bunch of colors. Plus, I am tall (5'10") and I can get the unisex cargo pants in regular length! When I want to splurge, though, I love the Koi pants. So comfy and soft and look like regular pants. Plus, gotta love all the pockets! Wow, congrats that you got in so soon! Nursing school is alot different than other areas of study. It's a different way of thinking, and test questions are different than what I've seen before. There is alot of application of knowledge and building on previous knowledge. My advice is to keep your A & P stuff and go over it before school starts. I did pretty well, though not as well as I wanted to. Just study hard and find a study group when you start the program. I never found study groups beneficial until nursing school, but it really helps. Hello fellow nurses! I graduated in May with my ADN and passed the NCLEX in July. I have been in an orientation program for a Med-Surg position since July and will be on my own in November! Hi all!! I have also been lurking around here through nursing school. I graduated in May from a community college here in town and passed the NCLEX in July, woohoo!! I am in an orientation program (Versant) and was hired on a Med-Surg floor for nights. I don't start my night shifts though until September, and I am a bit nervous about that. I have never worked a night shift before, so I am super worried about my sleep schedule! I graduated from PCC in May and I agree with what CardiacRN2006 said. Get your prereqs done asap to get yourself on the waiting list. I've heard it's 3 years now. I had a pretty good experience at PCC though. I didn't take A & P accelerated, but I have heard alot of good things about the instructor of the accelerated A & P at East Campus, which is where I took all of my prereqs. Good luck! More Tucsonans than I thought! :) I work at St. Mary's in Oncology/Med-Surg. I like that site, Bayley. 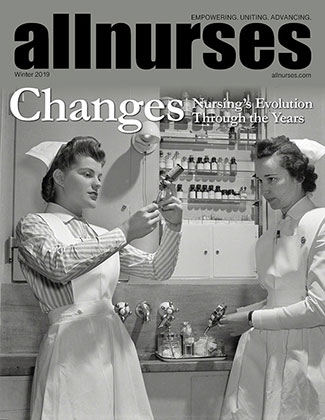 Here is another site I found: http://www.nursesdirect.com/ They carry alot of that stuff. I think their prices are okay, but be sure to check out the discount outlet section. I noticed some cute stuff in there! Congrats on graduation! I'm right there with you, just waiting to take the NCLEX! Welcome Michelle! Nice to see another Tucsonan! There are a few of us around here. Have you found the Arizona forum? Mostly people from Phoenix but there are a few people from Tucson on there. Are you going through Pima to get your degree? See you around the site! Starting NS this Fall at Pima, anyone else? Ok, thanks! I guess they go there now, at least according to my schedule. But they did tell us that what's on our schedule will probably change. They can't even tell us what hours we have clinicals until our second orientation, which is the first day of school. Makes it tough to arrange child care.